(1290) USA Olympic 88 Glasses. - Condition: Excellent. 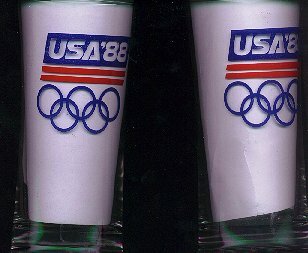 Two Olympic Glasses with the Olympic Rings, and USA'88 on the sides. The printing is done in Red and Blue. Glasses are beautifully shaped and nicely weighted. Glasses are 5 3/4" tall and 3" diameter. Price: $8.00 for one glass or $15.00 for the pair + shipping.